NEW competitive environment, NEW consumer behaviour, NEW channels of communication. The new profile of today’s consumer with regards to the global changes in the overall model of consummation. Communications: How can countries/regions interact with the globe? Join the virtual FB event for updates! Press Conference of the Federal Agency for Tourism "National Calendar". - Signing of a Cooperation Agreement b/n "VisitRussia" National Tourism Marketing Centre and "Appreal" LLC (mobile guide «TopTripTip – Travel in Russia»). - Signing of a Cooperation Agreement b/n "VisitRussia" National Tourism Marketing Centre and "Radiogid"(Russian producer and developer of modern devices for tourism industry). Plenary meeting: Communications: How Can Countries/Regions Interact with the World? "Communications as the Key Driver of Change: Globe, Individual, Business." "Future of Global Tourism Industry in Russia Depends on the Modern State Policy." Coffee Break / Media Briefing. Interactive panel with experts: Communication Matrix of Tourism: Engagement & Storytelling. How to tell the story of your touristic products and destinations, how to engage customers and transform them from consumers into ambassadors and tour-service sellers? Round Table of the Federal Agency for Tourism «Aspects of Promoting Russian Touristic Products Abroad». Keynote: Place marketing - Make Communications Global! How can effective communication strategy help you become the first-choice destination for travellers? Interactive panel with experts: Consistency in Touristic Brand Regulation. Alexander Gorokhov, Coordinator of the project "VisitRussia"
Interactive panel with experts: Events as the New Tool of Destination Communication with Tourist. Gennadiy Shatalov, Facilitator of "Russian Event Award"
Why we need to unite business structures and motivate them to do co-branding projects in order to promote a destination. 10 minutes of publicity for a partner in tourism. Expert's report: Event tourism and geobranding of cities/regions. Interactive panel with experts: Russia on the Global Tourism Market: Leading into the future! "Russia in Competitive Environment - Analysis of Tourism Competitiveness in 2015." "Regional touristic product in overseas markets. How to get success?" Conclusions from the first day of the Forum and defining the "Benchmarks of the Future". Public talk: National Association of Tourist Information Centres. Gala dinner for the Forum participants (upon special invitations only). Venue: Korston Hotel, Pushkin Hall. Opening of the second day. Keynote: Communications and New Technologies in Modern Tourism. "Digital Tourism Trends: What Will Happen to the Global Tourism Industry in the Next 5 Years?" "Analysis of the Digital Environment in the Russian Tourism"
Interactive panel with experts: Travellers "Love with Their Eyes"! How to be in tune with consumers? Get your communications upgraded. "Viral Videos in Promotion and Communication with Customers." "SMM - the Visual Language of Travellers." Expert’s report: User Generated Tourism: Recommendations, Shared Experience, Trust. Consumers trust recommendations rather than advertising, so the main channels of information and promotion of touristic products has become the information shared by the consumers. Suggestion for a discussion on whether it is possible to control the distribution of information produced by consumers. Keynote: Your Online Reputation Precedes You. Everything Starts in Digital. How communications online impact hotels and territories. Debates: Tour Operators and Online Services: Confrontation or Cooperation. How to build product distribution online and make domestic tourism competitive? Keynote: Touch the Tourism with TopTripTip. Talk Session: Integrated Marketing Communication Plan for Company in Chinese Market. Conclusions from the two days of the Forum and defining the "Benchmarks of the Future". 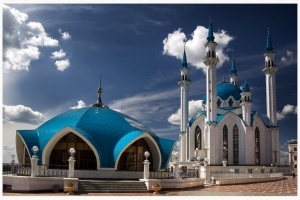 A guided tour around Kazan.